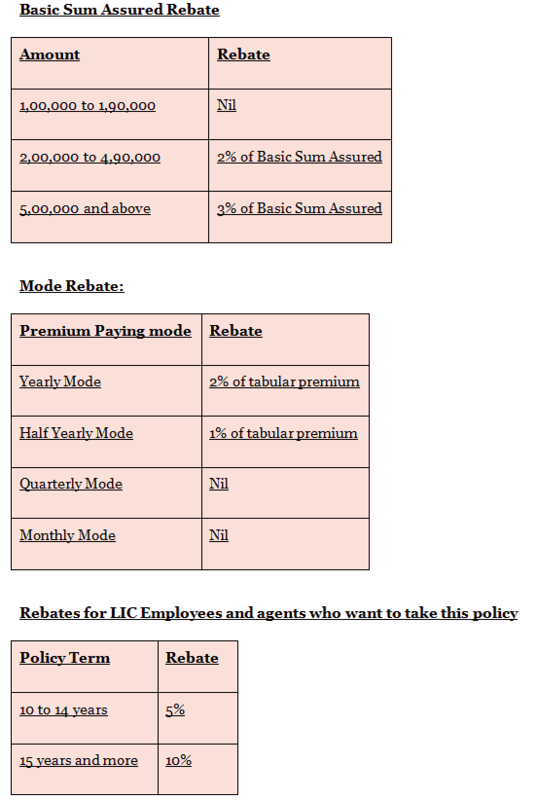 After launching two policies last week, LIC has come out with new policy Jeevan Lakshya (Plan No. 833) which is going to be with effect from March, 2015. Jeevan Lakshya is a limited premium paying?conventional profit linked Endowment Assurance plan which provides Annual Income Benefit to fulfill the family requirements. In case of death of the policy holder takes place prior to the maturity, 10% of the basic sum assured will be paid on every policy anniversary, further it also provides a lump sum amount at the time of maturity regardless of survival of the policyholder. Read: What is Minimum Basic Sum Assured? Should you Buy Jeevan Lakshya Plan 833? 1. In case of unfortunate event of death of policy holder happens during the policy term, 10% of the basic sum assured amount will be given to the nominee on every policy anniversary from the year of death till the date of maturity. In case of Accidental Death of the policy holder during the policy term, an amount equal to the ?Accident Benefit Sum Assured? will be payable to the nominee. In case of accidental permanent disability of the policy holder, Basic Sum Assured will be paid in form of equal monthly installments spread over 10 years. Also, the entire future premium belongs to the Accident Benefit rider will be waived off. 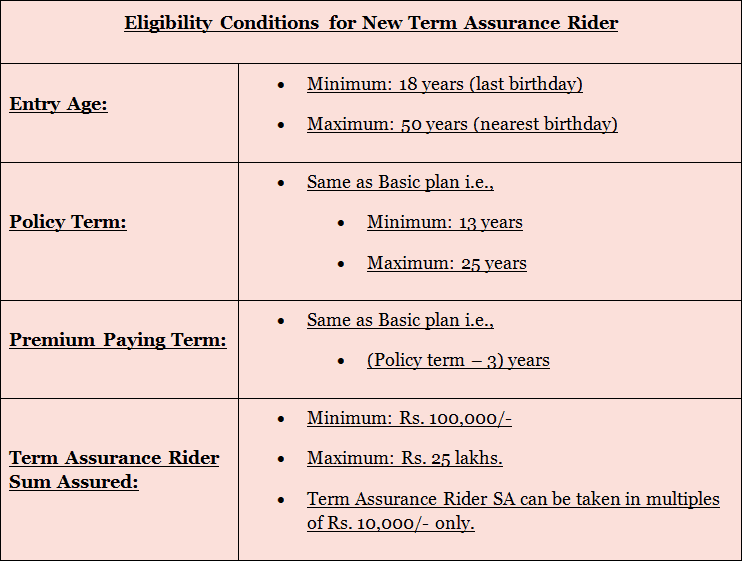 The benefit of the above rider can be availed only during the policy term. In the event of the death of the policy holder during the policy term, an amount to Term Assurance Rider Sum Assured shall be payable to the nominee. The benefit of this rider can be availed only if taken at the time of buying Jeevan Lakshya Policy. Mr.A is 30 years old and has taken?LIC Jeevan Lakshya policy for term period of 20 years. The Basic Sum Assured he opted for is Rs.20 lakhs. Now as per the plan, the premium paying terms comes down to 17 years i.e. policy term less 3?years. Starting from the 8th year, nominee will receive Rs.2 lakhs i.e. 10% of the basic sum assured, every year till the end of the maturity period of 20 years. At the end of the policy term?i.e. at the end of 20 years from the date of receipt of policy, nominee will receive Rs.22 lakhs (110% of the Basic Sum Assured) +?Vested simple Revisionary Bonuses + Final Additional Bonus (If Any). Maturity Amount = Rs.20?lakhs (Basic Sum Assured)?+ Vested Simple Revisionary Bonuses + Final Additional Bonus (if any). Jeevan Lakshya is just like any other Endowment Plan, but LIC made it look different by garnishing it with a unique death benefit. Even after that the policy does not serve the purpose. With a return of approx. 6% to 7 %, it will not even beat the inflation, although it gives you a life cover but mixing insurance with investment is never a worthy decision. Instead of buying Endowment Plans, it is always better to take sufficient term plan for life cover and invest surplus money in equity if you are not risk averse or debt instruments like PPF, Bank FDs etc. which gives decent return of around 9% to 10% annually. SIR, I WANT TO TAKE JEEVAN SHIKHAR POLICY. AT THE SAME TIME I WANT TO KNOW ABOUT LOAN AGAINST THIS POLICY AFTER 3 MONTHS.AMOUNT OF LOAN. WHAT HAPPENED WHEN LOAN IS NOT REPAID.ETC amount of interest. Plz send me the chart of jeevan Tarun . I REQUEST LIC TO UPLOAD PREMIUM CHART AS EARLY AS POSSIBILE. First of all please ask query related to the post. Regarding your query, No, you cannot contribute towards SSA through HUF.